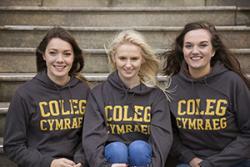 Sioned Everiss, Erin Jones and Sara StockwellThree Bangor University students have been recruited as Ambassadors by the Coleg Cymraeg Cenedlaethol with the aim of encouraging more prospective students to study part of their degree courses through Welsh. Erin Jones, Sara Stockwell and Sioned Everiss will start this month and be responsible for completing various tasks throughout the year. Their main role will be to persuade school pupils to follow part of their university studies through Welsh and present the advantages of studying through the language. They will represent the Coleg Cymraeg at school visits, UCAS fairs and Eisteddfodau as well as record their experiences in a brand new blog. Llais y Llysgennad will give a snapshot of their lives through pictures, videos and much more. The Coleg Cymraeg blog can be found here.